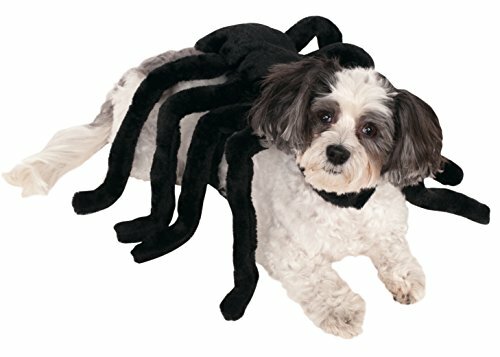 Easy-to-wear spider costume sized for your best friend straps around waist and neck. Rubie's pet costume collection features hundreds of non-licensed and licensed costumes. The vast selection of pet costumes extends beyond Halloween to other special occasions such as Easter, 4th of July, St. Patrick's Day, Christmas and more! In addition, the unique line of accessories includes wigs, hats, tutus, bandanas, wings and hair bows. From princesses and pirates to hot dogs and tacos, each Rubie's costume is carefully constructed for comfortable fit and is available in a variety of sizes. Important! Not all costumes will fit all pets, consider costume style and animal size; read the Rubie’s pet size chart and watch the sizing instruction video, do not select size based on breed. Family-owned, family-focused, and based in the USA Since 1950, Rubie’s is the world’s largest designer and manufacturer of costumes – of course they’d remember your four-legged best friend!